When a user tries to open a process either from Bizagi Studio or Bizagi Management Console, he/she may see an error due to differences between the source and the target environments. If this error is being presented during the execution of an advanced deployment, please refer to the article in this link. When trying to open an existing processes, the following error is displayed. 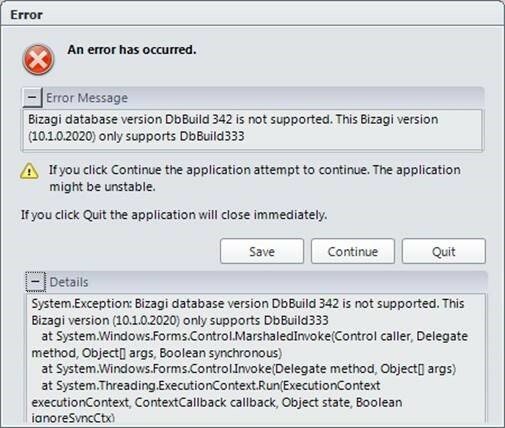 This error message is thrown when a user tries to access a project whose database is in a newer version than Bizagi Studio or Bizagi Management Console. This problem is usually presented when trying to restore a database backup from one environment to another, with different Bizagi versions. Also, when you try to access a Bizagi project located in another server. If the files are correct, verify that the versions of Bizagi Studio or Bizagi Management Console are the same for both source and target server and perform the necessary updates. For more information about how to verify the version, please refer to the article in this link. When you try to open your project and this error is presented, it is likely that you are trying to open a project located in an external server through your computer and your Bizagi version is lower that the version hosted in the server. Verify the version of your installed Bizagi Studio or Bizagi Management Console. Article has been viewed 6.1K times.